Should the media use drones for reporting? Drones, also known as a type of small unmanned aircraft, have been used to cover the Occupy Central protests and provide photographs and video footage that it would otherwise be impossible to shoot, for example, to verify the number of protesters present. 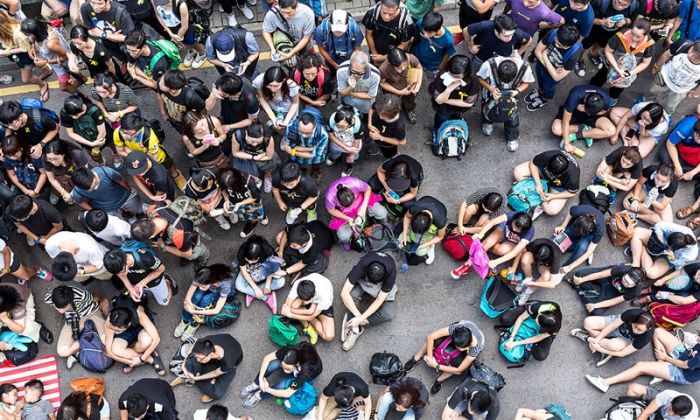 It is also a useful tool for filming disaster zones or documenting environmental pollution but there is a plethora of legal, safety and privacy questions that must be answered before this practice can become widespread among media organisations in Hong Kong. Earlier this week, CNN signed a research agreement with the US government’s Federal Aviation Administration (FAA). According to the agreement, CNN could experiment with using drones to collect news footage for journalistic purposes in the US air space only. “Our aim is to go beyond hobby-grade equipment and establish what options are available and workable to produce high quality video journalism using various types of UAVs and camera setups,” David Vigilante, CNN Senior Vice President, said. In 2013, the BBC also debuted its hexacopter drone for capturing video footage in the UK air space. Do drones, traditionally associated with the military and gathering of intelligence by governments, represent part of the future of journalism? A South China Morning Post spokesperson said the newspaper had evaluated the use of drones for its Occupy Central coverage but preferred to have reporters on the ground. The SCMP spokesperson said, “We felt that having reporters on the ground and among the crowds would be more effective in delivering the most accurate and impactful stories for our readers locally and around the world. In Hong Kong, the Civil Aviation Department (CAD) regulates unmanned aircraft weighing over seven kilograms, excluding the weight of its fuel. There are a set of rules, including the stipulation that drones cannot fly within five kilometres of an aerodrome, over 300 feet above ground and in visibility conditions of less than five kilometres. One of the trickiest CAD regulations to comply with is to demonstrate evidence of pilot competency. This means that the pilot of the drone must have qualifications to show that they have the required training to drive the drone. Michael Perry, a spokesperson for Hong Kong-based drone manufacturer DJI, said there is currently no fixed standard for a demonstration of pilot competency in Hong Kong. “CAD will review the information and assess the competency of the applicant including the competency of the pilot to operate the UAS. The competency of the pilot is assessed through the training syllabus and test that the pilot has to undergo in accordance with the applicant’s Operations Manual and practical demonstration of the skills of the pilot. A flight plan must be submitted to the CAD at least 28 days before takeoff. Perry said it is known within the drone operator industry that it takes up to 90 days to get approval from the CAD. “That obviously makes it difficult for breaking stories,” Perry said. A spokesperson for the Office of the Privacy Commissioner for Personal Data (PCPD) told Marketing it does not comment on the legality of any practice in general terms, which should be judged on a case-by-case basis. However, the PCPD spokesperson said there are a few nuggets of information relevant to whether drones used for non-recreational uses such as journalism could violate privacy laws in Hong Kong. “Under the Personal Data (Privacy) Ordinance, ‘personal data’ is defined as information which relates to a living person and can identify that person. The data exists in a form in which access or processing is practicable. Apart from written documents, personal data in other forms such as video are also covered under the Ordinance,” she said. According to the PCPD spokesperson, the ordinance is technology neutral and its core provisions are encapsulated in six Data Protection Principles, one of which requires that personal data is collected for a purpose directly relating to a function and activity of the data user, in a lawful and fair way and the data subjects must be informed of the purpose for which the data will be collected and used. These information nuggets already suggest that it is difficult to determine the legality of journalistic reporting using a drone. For example, it is unclear whether aerial footage of a crowd makes everyone in that crowd identifiable or whether it’s possible to inform a person located in a place that can only be accessed and viewed from high up in the air, that they are being photographed or filmed by a drone. However, the fog cannot be cleared from the future of using drones for journalistic reporting in Hong Kong unless the legal, safety and privacy concerns regarding this practice is addressed. "The pages load instantly, with zero lag.".. Media buyers could not view data on how ads were performing, neither could they edit live ad campaigns or start new ones. .. Under the bill, those found guilty of publishing or disseminating fake news facing up to 10 years in jail or face a fine of up to ..